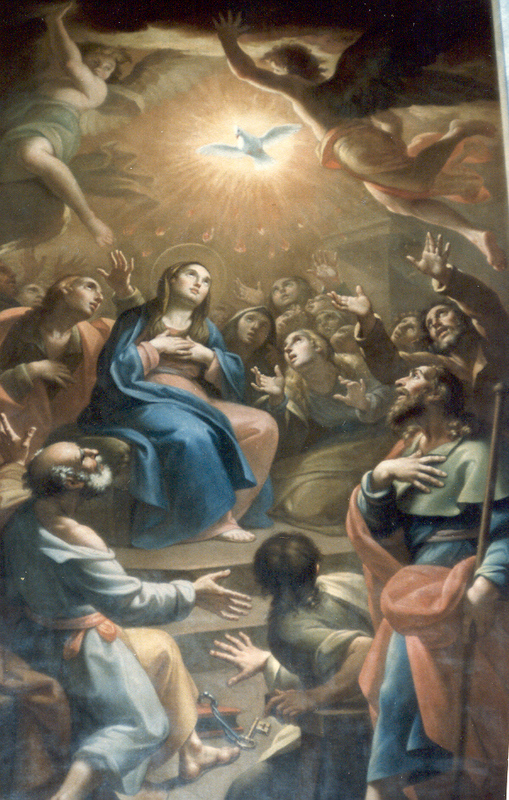 Today, Holy Mother Church celebrates the Solemnity of Pentecost, the event which occurred 50 days after Easter when the Holy Spirit descended upon the Apostles and Mary, firmly establishing the Church and invigorating the Apostles with the zeal to proclaim the Gospel to the farthest ends of the earth. To this day, Pentecost remains one of the three major Jewish feasts and is itself considered a harvest feast. For the Apostles, the harvest would not be wheat crops but the first believers of the Gospel. The events of Pentecost are not recorded in any of the Gospels. Instead, what we know about this event is taken from the second chapter of the Acts of the Apostles, found in today's first reading. So, our gospel today from St. John takes us back to Easter Sunday night when Jesus appeared to the Apostles, who were hiding in the upper room. He said to them, "Peace be with you. As the Father has sent me, so I send you." And when he had said this, he breathed on them and said to them, "Receive the Holy Spirit." Scripture scholars tell us that the verbal form for the Greek word for "breathe" used in this passage is used only one other time in all of Sacred Scripture - when God created the first man, Adam, and breathed life into his nostrils as we read in the Book of Genesis. So, just as Adam received life through this breath, so too does the Church receive her life-breath from Christ through the Holy Spirit. The power of the Holy Spirit cannot be overestimated. The same Spirit who imbued the Apostles at Pentecost 2000 years ago, is the very same Spirit, who yesterday, was invoked by Bishop Loverde at the Cathedral of St. Thomas More as he ordained three men to the Sacred Priesthood. It is the same spirit that pours forth the virtues and the gifts of the Holy Spirit into the soul of every person who is baptized either as an infant or later on in life. And, it is the same Spirit whom the priest invokes at every Mass during the Eucharistic Prayer. The Holy Spirit gives power to our sacraments and makes Jesus present in the Church today as He has from her inception, 2 millennia past. In the second reading, St. Paul tells us in his first letter to the Corinthians that no one can say, "Jesus is Lord," except by the Holy Spirit. By our baptism into the Body of Christ, it is the Holy Spirit who fills each one of us with the courage and the faith to bring the Gospel to our families and homes, our friends, our occupations and our schools. St. Paul assures us that although this evangelization may take different forms, it is the same Spirit who directs all of it and brings it to its completion and fulfillment. The expressions of the Spirit are as diverse as the members of the Body of Christ, which we all comprise. When we are challenged by the divers expressions of the Church's faith, we should recall the old maxim that states - in non-essentials, diversity; in essentials, unity; in all things, charity - the charity of the Holy Spirit. Recall, too, that the Christian tradition has always been synonymous with the spirit of evangelization. We find this commission in today's Gospel when our Lord sends the Apostles to preach the Good News. We are all aware of how challenging it can be to be witnesses to the Gospel truth in a society that is increasingly indifferent and often hostile to the Church. Encouraged and directed by the Holy Spirit, we must always remember that the Gospel is GOOD NEWS! There are so many ways we can and must participate in this task. It may be as simple as praying a family rosary once a week; saying grace before meals in public; or blessing ourselves with the Sign of the Cross each time we pass a Catholic or Orthodox church to remind ourselves of the Real Presence of Christ in the Tabernacle. It may mean participating in the various programs of the parish, especially on this Commitment Sunday; visiting the elderly and the infirm; defending the faith when it is attacked in the workplace; instilling the virtue of modesty in our children by forbidding them to dress immodestly and then putting forth a good example and dressing appropriately as well, especially for Mass; or limiting our television watching and internet viewing to only those programs and sites which do not contradict the Christian moral life. The list goes on. No matter what we choose to do, it is a condition of discipleship to engage ourselves in this active living of the faith. There is no such thing as private Christianity. If that had been the attitude of the Apostles, where would we be today? Pope John Paul II, in a homily given early in his Pontificate, remarked that in a certain way, Pentecost is still happening because the work of the Holy Spirit extends into all time. Every generation of believers has been challenged to spread the Gospel. The mandate is even more urgent in our time. If we find ourselves discouraged in our efforts because of lack of support or lack of results, we should think no further than the Apostles, who brought the greatest empire in recorded history, the Roman Empire, to its knees in the name of Christ based on two simple convictions: First, Jesus was the Son of God who died for us, and Second, He rose from the dead. The Apostles never took a formal theology class, they held no advanced degrees, nor did they have any pastoral training. They simply believed and allowed the Spirit to change their lives forever. Our first reading today, taken from the Acts of the Apostles, otherwise known as the Gospel of the Holy Spirit descended upon the Apostles and appeared to them in tongues of fire and they were filled with the Holy Spirit and began to speak in different languages as the Spirit enabled them to proclaim. In an instant, the confusion at the Tower of Babel was replaced with the unity of understanding found in the Spirit. How different the tenor among the Apostles, who, just 53 days prior to this event on the evening of the Last Supper, were a band of confused and scared men who abandoned their Lord and Master in His moment of gravest need and allowed Him to suffer a horrific death. What a difference their new life in the Spirit had made for them. What difference a life in the Spirit can make for us. Pentecost marks the end of the Easter Season. Tomorrow, we will return to Ordinary Time. By the grace of God, let us resolve to live in the Spirit, sanctifying our work and leisure in our day-to-day living. As we continue the celebration of this Solemnity, we entrust ourselves to the Blessed Mother, who literally witnessed this amazing transformation in the lives of her Son's apostles. As Pope Paul VI once noted, "She who gave birth to our Savior now presides over the birth of the Church." May Mary intercede for each one of us who so desperately rely on God's grace to convert our culture and seek our own conversion. Strengthened by the Spirit, may we make the Psalmist's words our own when he exclaims, "Lord send out your Spirit, and renew the face of the earth." LORD, SEND OUT YOUR SPIRIT AND RENEW THE FACE OF THE EARTH.